"Harbor Freeway" redirects here. For the demolished freeway in Portland, Oregon, see Harbor Drive. For the first road in California designated I-110, see Interstate 110 (California 1958–65). Route 110, consisting of State Route 110 (SR 110) and Interstate 110 (I-110), is a state highway in the Los Angeles metropolitan area of the U.S. state of California, built to freeway standards. The entire route connects San Pedro and the Port of Los Angeles with Downtown Los Angeles and Pasadena. The southern segment from San Pedro to Interstate 10 in downtown Los Angeles is signed as I-110, while the northern segment to Pasadena is signed as SR 110. The entire length of I-110, as well as SR 110 south of the Four Level Interchange with US 101, is the Harbor Freeway, and SR 110 north from US 101 to Pasadena is the historic Arroyo Seco Parkway, the first freeway in the western United States. I-110 is one of two 3-digit interstate designations to appear on opposite coasts; I-280 in California and New Jersey is the other. The Harbor Freeway, signed as Interstate 110, begins at Gaffey Street in San Pedro, where it then travels mostly due north to the Santa Monica Freeway (Interstate 10) at a point south of downtown Los Angeles, where it becomes signed as State Route 110. I-110 is primarily within the city limits of Los Angeles, running right the South Los Angeles region and the Harbor Gateway, a two-mile (3 km) wide north–south corridor that was annexed by the city of Los Angeles specifically to connect San Pedro, Wilmington and the Port of Los Angeles with the rest the city. In addition, the Harbor Transitway, a grade-separated bus and high-occupancy vehicle corridor in the median of the 110, runs between State Route 91 (Gardena Freeway) and the south side of Downtown Los Angeles. The Harbor Freeway, along with the Long Beach Freeway (Interstate 710), are the principal means for freight from the port of Los Angeles to rail yards and warehouses further inland. Its interchange with the Santa Monica Freeway is notoriously busy and congested, and the portions bordering Bunker Hill in northwest Downtown Los Angeles are choked with traffic at peak travel times. Notable landmarks and attractions near the Harbor Freeway include the California State University, Dominguez Hills; Watts Towers; Exposition Park (including the Los Angeles Memorial Coliseum, the Banc of California Stadium and soon the Lucas Museum of Narrative Art); the University of Southern California; Staples Center; L.A. Live, Los Angeles Harbor College; the skyline of Downtown Los Angeles; and the Los Angeles Convention Center. SR 110 continues north on the Arroyo Seco Parkway to Pasadena. 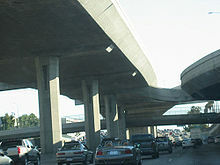 The Harbor Freeway is noted for its elaborate high-occupancy toll lane feature, with the HOT lanes elevated above the rest of traffic in many areas, constructed in 1994 by C.C. Myers, Inc. as HOV lanes and converted to HOT lanes in 2012. Of particular note is the Judge Harry Pregerson Interchange, which contains the most elaborate network of direct HOV/HOT connectors in Los Angeles County. It includes a 7-story ramp that connects the Century Freeway's HOV lanes to the Harbor Freeway's northbound HOT lanes and offers splendid views of the entire Los Angeles Basin and the San Gabriel Mountains.The interchange with State Route 91 (formally known as the Edmund J. Russ Interchange) is also fairly large. Route 110 is part of the California Freeway and Expressway System, and is part of the National Highway System, a network of highways that are considered essential to the country's economy, defense, and mobility by the Federal Highway Administration. The Harbor Freeway southbound entering "The Slot" after emerging from the "4-level"
Aerial view from the north of the Harbor Freeway (I-110) and its Judge Harry Pregerson Interchange with the Century Freeway (I-105), on approach to Los Angeles International Airport. The Palos Verdes Peninsula and Santa Catalina Island are visible in the distance. In the 1924 Major Street Traffic Plan for Los Angeles, a widening of Figueroa Street to San Pedro as a good road to the Port of Los Angeles was proposed. Progress was slow, and in 1933 the state legislature added the entire length to the state highway system as Route 165, an unsigned designation. This route not only extended from San Pedro north to Los Angeles, but continued through the city-built Figueroa Street Tunnels and along the northern extension of Figueroa Street to Eagle Rock, and then followed Linda Vista Avenue (via an overlap on Route 161 (SR 134) over the Colorado Street Bridge) to Route 9 (now I-210) at the Devil's Gate Reservoir. The entire length of Route 165 became Sign Route 11 in 1934. U.S. Route 6 was also assigned to the portion between SR 1 and Avenue 26 in 1937, and at about the same time US 66 was moved from Eagle Rock Boulevard to Figueroa Street, overlapping SR 11 between Sunset Boulevard (US 101) and Colorado Street (SR 134). The Harbor Freeway gradually pushed south, opening to Olympic Boulevard on March 23, 1954 and Washington Boulevard on May 14, 1954. On March 27, 1956, the highway was extended to 42nd Street, and on April 24, 1957 it reached temporary ramps at 88th Place. Further extensions were made to Century Boulevard on July 31, 1958, 124th Street on September 24, 1958, Alondra Boulevard (which the county widened to carry the load) on May 2, 1960, 190th Street on July 15, 1960, Torrance Boulevard on August 28, 1962, and finally Pacific Coast Highway (SR 1) on September 26, 1962. There it connected with a section that had been open since June 19, 1956, from Pacific Coast Highway south to Channel Street. Along with the Vincent Thomas Bridge to Terminal Island, the final piece in San Pedro opened on July 9, 1970, completing the Harbor Freeway to its present length. In December 1978, the Harbor Freeway was approved as an Interstate Highway by the FHWA. In 1981, the SR 11 designation was renumbered as Interstate 110 on the Harbor Freeway, and State Route 110 on the Pasadena Freeway. In 2001, Richard Ankrom, a local artist who got lost trying to get onto Interstate 5 North from northbound I-110 because there was no clear official signage labeling access to I-5 North, solved his frustration by covertly modifying one of the overhead signs on the freeway just before the Four Level Interchange (34°03′21″N 118°15′22″W﻿ / ﻿34.055759°N 118.256181°W﻿ / 34.055759; -118.256181). Using official government sign specifications, Ankrom fabricated two sign pieces, one being an Interstate 5 marker shield and the other with the word "NORTH", and affixed them to the left side of the sign. He performed his modifications in broad daylight, disguised as a Caltrans worker. In that district, Caltrans has three sign crews, each thinking one of the other two crews did the installation. After nine months, at Ankrom's request, the Los Angeles Downtown News broke the story. Prior to Ankrom's work, the only signage directing motorists to the 5 North off-ramp came at a quarter-mile before the exit, thus forcing many to merge across multiple lanes in a very short distance. The signs were inspected by Caltrans to ensure they would not fall off onto the road below. Ankrom was never charged, despite statements from officials that his actions were illegal. Ankrom referred to his sign project as "Guerilla Public Service". Caltrans later added an additional "5 North" sign over the left northbound lane at the entrance to the Figueroa Street Tunnels, as well as new electric signage, which will note when an additional lane is available for those wishing to transition to northbound Interstate 5 (converting the current single lane transition to dual lanes). In 2009, Caltrans replaced all signage along this segment with newer, more reflective versions. These new signs include Ankrom's original improvements. Despite the increased traffic in Los Angeles, including trucks shipping products from the Port of Los Angeles in San Pedro, there are currently no plans to upgrade the rest of I-110 from I-10 to Pasadena to Interstate standards. Instead, Caltrans has pushed for a protected status alternative to preserve the Arroyo Seco Parkway as a historic landmark. The state legislature designated the original section, north of the Figueroa Street Viaduct, as a "California Historic Parkway" (part of the State Scenic Highway System reserved for freeways built before 1945) in 1993; the only other highway so designated is the Cabrillo Freeway (SR 163) in San Diego. The American Society of Civil Engineers named it a National Civil Engineering Landmark in 1999, and it became a National Scenic Byway in 2002. Except where prefixed with a letter, postmiles were measured on the road as it was in 1964, based on the alignment that existed at the time, and do not necessarily reflect current mileage. R reflects a realignment in the route since then, M indicates a second realignment, L refers an overlap due to a correction or change, and T indicates postmiles classified as temporary (for a full list of prefixes, see the list of postmile definitions). Segments that remain unconstructed or have been relinquished to local control may be omitted. The entire route is in Los Angeles County. ^ "OFFICIALLY DESIGNATED STATE SCENIC HIGHWAYS AND HISTORIC PARKWAYS". California Department of Transportation. Retrieved March 27, 2019. ^ a b c California Department of Transportation. "State Truck Route List". Sacramento: California Department of Transportation. Archived from the original (XLS file) on June 30, 2015. Retrieved June 30, 2015. ^ 2007 Named Freeways, Highways, Structures and Other Appurtenances in California (PDF). Caltrans. p. 71. Archived from the original (PDF) on October 14, 2012. Retrieved March 27, 2007. ^ Ryan, Colin (April 9, 2010). "America's First Freeway: The Arroyo Seco Parkway, aka, the 110". Truck Trend. El Segundo, California: Extreme Venturs, LLC. Retrieved April 10, 2018. "The History of the Arroyo Seco Parkway". Departures. KCET. October 24, 2011. Retrieved April 10, 2010. Kevin Break (2015). Bridges of Downtown Los Angeles. Arcadia Publishing. p. 94. ISBN 978-1-4671-3353-1. Johnson, Davey G. (June 29, 2006). "America's First Freeway: The 110". Jalopnik. Gizmodo Media. Retrieved April 10, 2018. National Park Service's Heritage Education Services. "Arroyo Seco Parkway". Route 66. United States Department of the Interior. Retrieved April 10, 2018. Sproul, Suzanne (August 28, 2017). "Arroyo Seco Parkway, California's first freeway, celebrates 75 years". Los Angeles Daily News. Retrieved April 10, 2018. The Arroyo Seco Parkway, once called the Pasadena Freeway (110 Freeway) before the name was changed back in 2010, is considered by many to be the first freeway in the state and in the nation. Rick Thomas (2008). The Arroyo Seco. Arcadia Publishing. ISBN 978-0-7385-5608-6. ^ "Article 2 of Chapter 2 of Division 1 of the California Streets and Highways Code". Sacramento: California Office of Legislative Counsel. Retrieved February 6, 2019. ^ Federal Highway Administration (March 25, 2015). 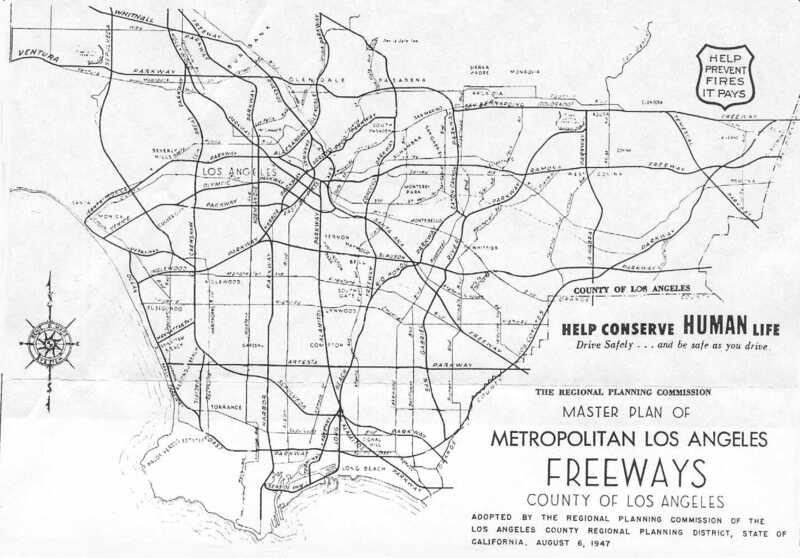 National Highway System: Los Angeles, CA (PDF) (Map). Scale not given. Washington, DC: Federal Highway Administration. Retrieved October 1, 2017. ^ Natzke, Stefan; Neathery, Mike & Adderly, Kevin (June 20, 2012). "What is the National Highway System?". National Highway System. Washington, DC: Federal Highway Administration. Retrieved July 1, 2012. ^ California State Assembly. "An act to amend sections 2, 3 and 5 and to add two sections to be numbered 6 and 7 to an act entitled 'An act to provide for the acquisition of rights of way for and the construction, maintenance..." Fiftieth Session of the Legislature. Statutes of California. State of California. Ch. 767 p. 2040p. 2034–2042. : "San Pedro to State Highway Route 9 near La Canada via Figueroa Street." ^ California State Assembly. "An act to establish a Streets and Highways Code, thereby consolidating and revising the law relating to public ways and all appurtenances thereto, and to repeal certain acts and parts of acts specified herein". Fifty-first Session of the Legislature. Statutes of California. State of California. Ch. 29 p. 285p. 287. : "Route 165 is from San Pedro to Route 9 near La Canada via Figueroa Street." ^ California State Assembly. "An act...relating to State highways". Fifty-first Session of the Legislature. Statutes of California. State of California. Ch. 274 p. 959, 285. : "Route 165 is from San Pedro to Route 9 near La Canada via Figueroa Street and Linda Vista Avenue." ^ "California Highways (www.cahighways.org): Routes 105 through 112". www.cahighways.org. Retrieved January 26, 2013. ^ "freeway signs". Ankrom.org. Retrieved January 26, 2013. ^ California State Assembly. "An act to add Sections 280, 281, 282, and 283 to the Streets and Highways Code, relating to highways". 1993–1994 Session of the Legislature. Statutes of California. State of California. Ch. 179. ^ California Department of Transportation (July 2007). "Log of Bridges on State Highways". Sacramento: California Department of Transportation. ^ a b "2014 Named Freeways, Highways, Structures and Other Appurtenances in California" (PDF). California Department of Transportation. Retrieved June 20, 2015. Wikimedia Commons has media related to Interstate 110 and State Route 110 (California). This page was last edited on 30 March 2019, at 22:34 (UTC).